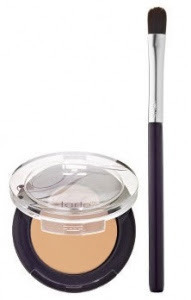 60-Second Beauty Tip: Kill Undereye Bags and Circles with Tarte Dark Circle Defense | Fashion. Style. Beauty. | Life is short. Live well. I will vouch for the fact that my life is really hectic. I look at my schedule on a daily basis and, like most women, I have no idea how I get it all done. This lack of sleep and constant on-the-go schedule can make even those of us with the best skin into a bit of a bag lady. No, I don’t mean the fabulous handbags like those you see on our arms. I mean undereye bags and dark circles, the kind that make you look haggard and like you want to pull a Sean Penn on anyone who tries to take your photograph. There are all sorts of little tricks you can pull to get rid of them (cold green teabags on your eyes for 15 min) but if you’ve got 60 seconds, there’s a better way: Tarte Dark Circle Defense Natural Under Eye Corrector ($32). Available in two shades to match a good number of skin tones, this little pot of goodness comes with its own concealer brush and with a couple of dabs under the eyes over moisturizer but under foundation or, in my case, tinted moisturizer, dark circles and undereye bags disappear. The product by its definition is said to contain “finely milled light refracting minerals actually brighten skin to help camouflage dark circles, puffiness, redness, fine lines and wrinkles.” The package says that it reduces undereye puffiness in four weeks and after 3 weeks of using it consistently, I will vouch that the claims are true: continued use of the product under my eyes has made the area noticeably less raised and the fine lines are much less noticeable without makeup. I’ve always been a big fan of Tarte but this product has put them on a whole new level for me. Too busy to take a breather to get rid of dark circles? Order this product from their website or hit Sephora right this minute and keep one in your purse at all times. Better yet, keep one in your purse and another at home on your makeup table. After all, it’s lovely to be seen with great bags, just make sure they’re of the designer variety.